A 62-year-old Caucasian male with history of sarcoidosis presented with three months of low grade fevers, progressively worsening fatigue, headaches, cough, recently developed rash and visual changes. Physical examination was significant for fever, decreased visual acuity, mild tenderness to palpation of the right upper quadrant, and a salmon colored maculopapular rash on the abdomen, bilateral flanks, and thighs. Laboratory studies were significant for an elevated LDH (645 U/L), ESR (66 mm/hr), Ferritin (1223 ng/mL) and pancytopenia. Alkaline phosphatase was elevated (283) but liver associated enzymes were otherwise normal. Serum and CSF studies for infectious and autoimmune etiologies were unremarkable. Abdominal CT scan revealed cirrhosis with minimal ascites, splenomegaly and the absence of lymphadenopathy. Chest CT showed upper lobe pleural-parenchymal scarring suggestive of previous infection/inflammation and scattered pulmonary nodules without lymphadenopathy. Skin and bone marrow biopsies were unremarkable. The final diagnosis was ascertained from liver biopsy which initially suggested primary hepatic lymphoma. 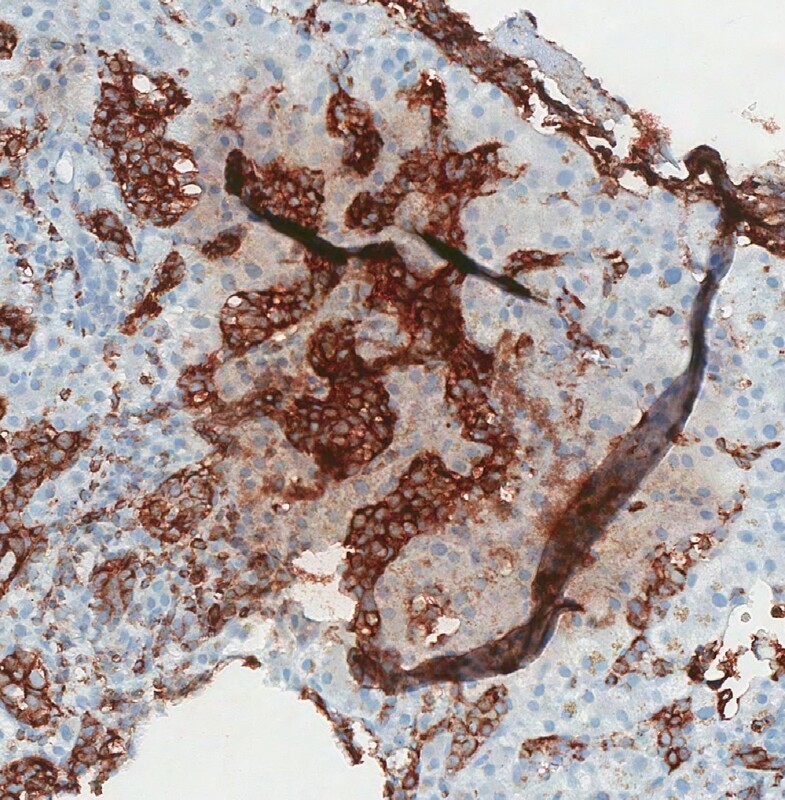 Immunohistochemical testing revealed positive CD5 and CD20 staining patterns, and the final pathological report confirmed a diagnosis of intravascular B cell lymphoma (IVBCL). He was treated with rituximab and after a hospital course complicated by tumor lysis syndrome, ATN, and stress induced cardiomyopathy with third degree AV block, he was successfully discharged to continue chemotherapy as an outpatient. The pathophysiology of IVBCL is poorly understood. However, what is known is that this lymphoma preferentially affects the lumen of small blood vessels, particularly capillaries. Because it can affect blood vessels in any organ of the body, the clinical presentation is quite variable. B symptoms such as fever, fatigue, and loss of appetite are extremely common; and hallmarks of the disease include an absence of lymphadenopathy and relative sparing of surrounding tissue. Interestingly, the clinical presentation varies based on geographical location. Patients from Western countries typically present with CNS and skin involvement, whereas patients from Asian countries typically present with bone marrow involvement, hepatosplenomegaly, thrombocytopenia, and hemophagocytic syndrome. Though as our case demonstrates, individuals may show overlapping geographic presentation. Common laboratory findings include elevated LDH, anemia, elevated ESR, altered hepatic, renal or thyroid function panel and presence of serum monoclonal protein. However, these laboratory findings are nonspecific and definitive diagnosis is made by tissue biopsy which shows large neoplastic B cells within the intravascular spaces. Therapeutic options including combination chemotherapy (typically CHOP regimen) with the addition of rituximab have helped to improve outcomes, however IVBCL remains an aggressive malignancy that carries a poor prognosis. Conclusions: It is important that clinicians recognize the varied clinical presentation of this rare form of B cell lymphoma, as timely diagnosis plays an important role in prognosis. Okoronkwo SM, Joshi R, Rosenblatt L, Nathanson R, Willborn K. A Rare Case of Primary Intravascular B-Cell Lymphoma of the Liver Presenting As Fever of Unknown Origin. Abstract published at Hospital Medicine 2016, March 6-9, San Diego, Calif. Abstract 714. Journal of Hospital Medicine. 2016; 11 (suppl 1). https://www.shmabstracts.com/abstract/a-rare-case-of-primary-intravascular-b-cell-lymphoma-of-the-liver-presenting-as-fever-of-unknown-origin/. Accessed April 25, 2019.